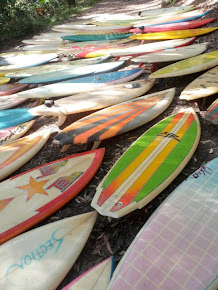 This is the forth in a series of postings where I try to determine the worlds most famous and culturally valuable surfboards, where they are now, examine their history and celebrate their obscurity. The next board I'd like to submit for your consideration (again) is the square tail single fin from Puberty Blues. 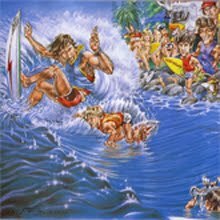 Puberty Blues is an Australian movie based on Kathy Lette's novel about growing up the the surf side suburb of Cronulla in the late 70's. 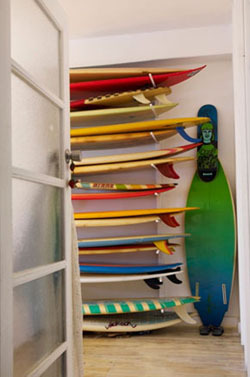 The story climaxes when the two heroines overcome their hardships and prejudices and buy their own board and just go surfing. 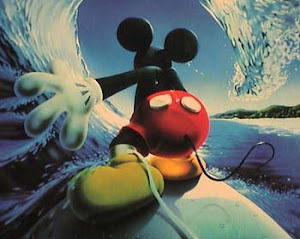 The movie made a huge impact on me as a kid growing up in love with surfing. But it wasn't till I watched Bombora - The Story of Australian Surfing that I realized just how influential the movie really was. 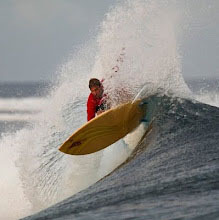 A number professional surfers in the documentary site the movie as one of their main inspirations to get involved in surfing. 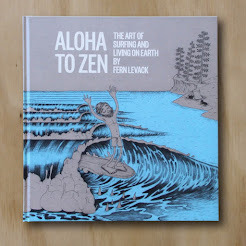 World champ Mark Occhilupo actually scored a extras part in the movie as a 10 year old grom! c) Where is it now? I think Keith already knows the answer to this one! If it was an Emerald then its a big chance it was shaped by Steve Griffiths , "Griffo". 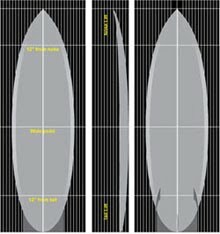 Hi there guys, I actually know a fair bit about this surfboard's history. 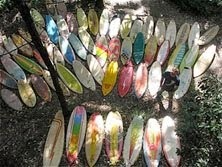 First of all the surfboard is 100% an Emerald Surfboard, and a Steve Griffiths shape. 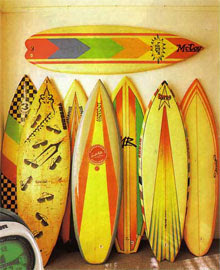 I know this for 2 reasons, #1 I used to ride my bike home from school (De La Salle, Caringbah) every day past Emerald Surfboards & they had a rack out the front of the Factory/shop and this board was on display for a fair while. 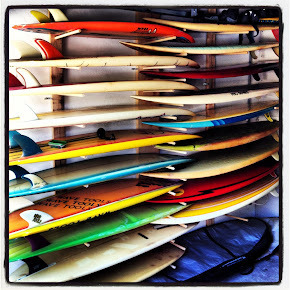 I used to stop off and check out their boards, but I absolutely loved this board. 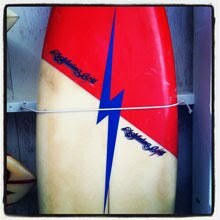 And #2 reason I know about this board is a kid I went to school with bought it. 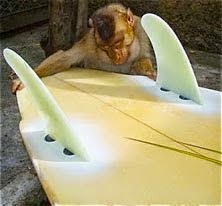 He didn't have it for long as the board was fairly short & he out grew it. 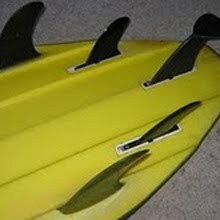 Now here's the real interesting thing, they made 2 boards with the same spray job, a single fin & a twin fin. The twin fin didn't have the red around the edge, just black. I wouldn't think these boards would have survived, but I sure hope so. site. 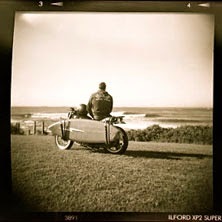 Adv was in Surfing World in the early 80s. 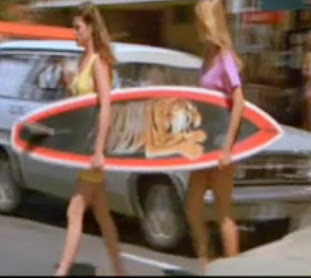 The board used to be mounted on the wall of the Windensea shop where the girls in Puberty Blues are seen leaving to cross the road. Just picked up an emerald board off council clean up with the same spray but no red around the edge but it is a single fin swallow tail double flyer. Yeeeeeewwwww! Hey, i bought a 2nd hand " Emerald nulla bord " back in 2000. I was about to sell it but thought i would do some research on it first which bought me to here. Is there a market for Emerald boards? My "guess" is that it was made in the late 80's to mid 90's judging by the fluro logos and girps which was popular around that time. Any info would be greatly apppreciated, cheers. Can you send us any photos? Yeah sure, do you have a email address or something? Hey damion, did you get a chance to look at Emerald board?